On Friday, YouTube celebrates the fifth anniversary of its first video posting, a modest tourism clip that would launch an Internet revolution. In that almost shockingly short time, the video site has become a verb, a logo used to help sell Casio cameras and the dominant player in its field several times over. It is almost everybody’s first resource for online video, the place we look for that clip we heard about and the place we, too often, lose ourselves in a chain of video distraction. 19 In seconds, the length of the first video uploaded to YouTube, of co-founder Jawed Karim at San Diego Zoo. Feb. 14, 2005 The date YouTube registered its domain name. April 23, 2005 The date the first video was uploaded to YouTube. 1.96 million The number of times the first video has been played, as of midweek. 185.39 million The number of times the most popular video on YouTube, Lady Gaga’s “Bad Romance,” has been played. 252 In seconds, the average length of a YouTube video, according to Sysomos, a Toronto firm that analyzes social media. 24 Hours of video uploaded to YouTube each minute, a milestone reached in March 2009.1 billion Views per day, the almost ridiculously high popularity threshold the site says it reached in October 2009. 3.15 The factor by which YouTube’s number of unique monthly viewers (96.1 million) exceeds that of Yahoo (30.5 million), the second-place U.S. online video site in that category, according to Nielsen. 6.6 The factor by which YouTube’s number of monthly video streams served (4.67 billion) exceeds that of Hulu(707.5 million), the second-place site in that category, according to Nielsen. 5 The maximum number of stars available in YouTube’s old on-site ratings system, replaced in the March redesign by a simpler “likes/dislikes” model. 1 Out of 100, the number of YouTube comments that actually have something interesting to say (this author’s estimate). 2 The number of “highest rated” comments YouTube lists immediately under videos, its recent attempt to fight its bad-comment problem. 68 Estimate of the number of parodies of the Hitler in the bunker scene from the film “Downfall” posted on YouTube and other sites, according to the Guardian. April 2, 2010 The date news broke that YouTube was removing the “Downfall” parodies because of copyright concerns. 2.14 million The number of subscribers to NigaHiga’s channel of Asian-themed comedy videos, the most subscribed to on YouTube. $30,000 The amount the video “David After Dentist,” of an incoherent little kid in the back seat of a car, has earned for its uploader through an ad revenue sharing program, according to YouTube. 60 The number of matches of the Indian Premier League cricket season YouTube will have streamed after it shows the final match live April 25, its biggest foray into free sports streaming. 31 The percent of YouTube videos embedded by bloggers that are music videos, according to a study by Sysomos. 14,600 The number of videos that comes up when you search for “kittens” on YouTube. It seems like Youtube has been with us longer than just five years. I can remember when Oprah had the founders on to speak with them about how that conceptualized the idea of the site. I now see friends, teachers, and even parents viewing the site. At first I did not give Youtube any real credit because it was just videos made my ordinary people. I saw no real quality in the posts. I have now seen teachers use it and my parents referring to it. I count it as a legit site and hope to see its popularity to continue. I think it is an easy and efficient way to spread information and hope that it has another five years of success. YouTube is only 5 years old? wow! Honestly I thought it was older than that. To think that when we are older we are going to tell our children that we started off with YouTube. YouTube has introduced us to new things every day that we would have never known about. YouTube has made people famous overnight. I think of YouTube as a visual Google at times. You can find instructional video, music, and flat-out funny stuff. I am not the biggest user of YouTube but when I am in need of some how -to -do I can go there. I remember when Youtube was first started back when I was in high school. I was hesitant to use it at first because for some reason I was afraid I was going to get caught and then fined. I compared it to LimeWire or Napster and thought watching the videos was a kind of pyroting. Today I use Youtube on a daily basis. Whether it be listening a new song I heard somewhere or watching funny videos people upload, Youtube brightens up my days. Most bloggers post their videos from there as well. All the videos I have posted came from Youtube. I don’t know what we would do without it. It has become such an intricate part of the web; I think internet usage would decrease if Youtube was taken away. 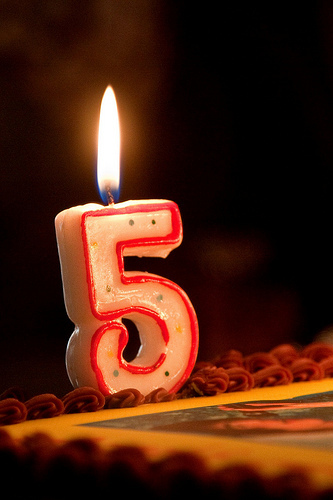 I can’t believe that YouTube is 5 years old! I also can’t believe Lady Gaga’s “Bad Romance” is the top played video on YouTube. YouTube has become a phenomenon that practically every field can use. Many of my professors use YouTube as an educational supplement and I have posted several YouTube videos to my own blog for our class. I don’t know what we would do without YouTube now. I personally use it for so many things and have it book marked on my Blackberry. It also cracks me up to see how YouTube has reached every generation. Over Christmas break I came home to my dad telling me I had to watch this video on YouTube. It will be interesting to see how YouTube continues to evolve over the next couple of years! I can’t believe it’s only been 5 years. It feels like longer. What is the exact date of the start of YouTube?.